3Dhubs is a 3D print community for 3D printer owners and 3D designers who need to print something on a 3D printer. The other day, 3D Hubs has send a questionnaire to their Hub owner (I am a hub in the city where I live in). 3DHubs would like to know more about the owners of 3D printers, who are listed on their website, and how the 3D printers are used. Some questions that 3Dhubs asked to their partners with a printer are listed below. In my opinion, 3Dhubs is trying to ‘harvest’ information from their online community about the industry is heading. So, from these questions, we can learn a lot about many aspects of the 3Dprint industry. Foof for thought! What are your thoughts? Please feel free to contact me anytime! How long have you been using your Ultimaker 2? How many prints have you made with your machine? What do you mainly use your Ultimaker 2 for? 1 = Only luck keeps this machine together. 5 = Well designed, quality assembly & materials. 1 = Requires an engineering degree to run. 5 = Just plug & play. 1 = Breaks down all the time. 5 = No issues at all. For every 10 print attempts, how many fail due to the printer? 1 = Hello… anyone there? 5 = Great! Active community. 1 = Never again, overpriced for what it offers. 5 = My Ultimaker 2 is great value for money. 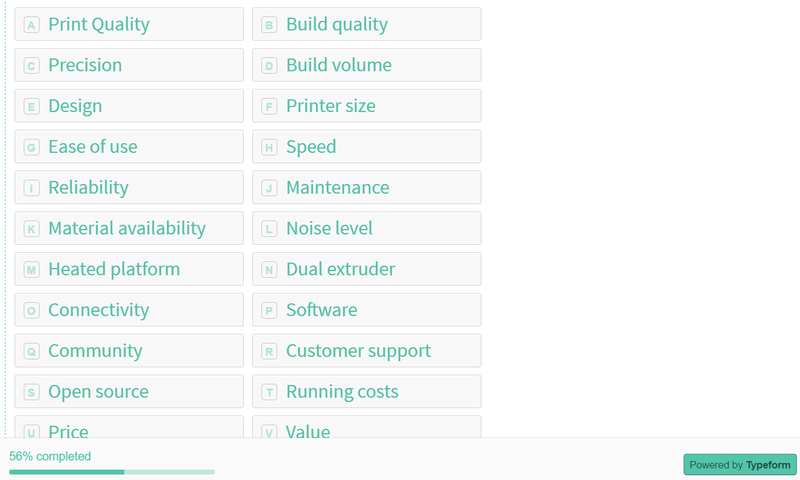 Which aspects of the Ultimaker 2 are you most satisfied with? Please choose from the list or add your own choices at “other”. What are the biggest downsides of the Ultimaker 2? Would you recommend the Ultimaker 2? Hobbyist, Product Designers, Engineers, Students, Educators, Budget Buyers, Entrepreneurs, Other. What’s your opinion about the Ultimaker 2? Would you like to review it in a few sentences? What will your next 3D Printer purchase be? If the next version of your current printer, just choose the current one’s name. If you’re not planning to buy a new one, choose “I’m not planning to buy a new 3D Printer”. If it’s not on the list, choose “Other”.